The site is published and maintained by the University of Glasgow. Whom do I contact with a comment or query on the content of the site? Queries about content should be made using our enquiries form. Requests for additional information about individual properties should be sent direct to the relevant property if this is publicly owned. Contact details are available on Charles Rennie Mackintosh Society website. Can I use images from the site? Images from this site are for research purposes only. If you require images for other purposes you must contact the relevant copyright owner. No images may be reproduced without the prior written agreement of the appropriate copyright holder. The copyright of all images unless otherwise specified resides with the University of Glasgow. For University of Glasgow images, please contact The Photo Librarian, The Hunterian, University of Glasgow, Glasgow G12 8QQ. For all other requests, please contact the copyright holder direct. How do I credit the site in a publication? Acknowledgement should be made to: Pamela Robertson, Joseph Sharples, Nicky Imrie, Mackintosh Architecture: Context, Making and Meaning www.mackintosh-architecture.gla.ac.uk, 2014. What buildings are open to the public? Full information on public access is provided on the website of Glasgow Mackintosh. Many of the properties listed are still in private ownership and their privacy must be respected; unauthorized entrance is illegal. Is more material available than is contained in the site? To the best of our knowledge, the site provides a complete catalogue of Mackintosh's architectural projects and drawings, and of the Dean of Guild drawings for the practice from 1889 to 1913; as well as a complete photographic record of the known office record books. Selections only of archival material and period photographs are included and additional material will, in most cases, exist with properties in public ownership or their managing bodies. Contact the properties direct for further information. Is it possible to see Mackintosh's original architectural drawings? How can I find out more about Mackintosh? A bibliography will be given on the final site. Historic Scotland is the executive agency of the Scottish government responsible for safeguarding and promoting Scotland's historic environment. What is the Royal Commission on the Ancient and Historic Monuments of Scotland? 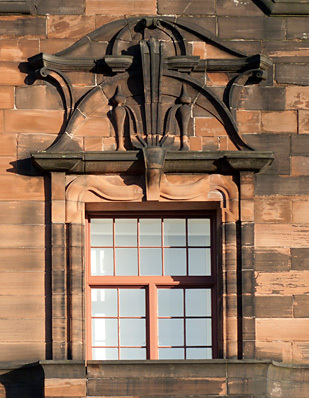 The Royal Commission collects, records and interprets information on Scotland's built heritage.